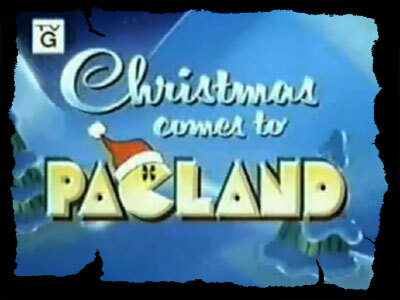 CLASSIC INDUCTION: Christmas Comes to Pac-Land: The Cartoon That Will Make You Hate Pac-Man AND Santa - WrestleCrap - The Very Worst of Pro Wrestling! Standard December Disclaimer: Every year, I take a week away from doing wrestling inductions to review the very worst of Christmas movies and specials. And this is that week! I do hope you enjoy a very special, and very horrible, Christmas Comes to Pac-Land! As anyone who has read this site for, oh, 90 seconds can tell you, I am a huge, HUGE video game fan. As a child of the 70’s, and a teen of the 80’s, it seemed inevitable that I would wind up being a huge game geek. And believe me I was that in every sense of the word. I lived and breathed the arcade scene, to the point that to this day, I still rank vacations from my youth based on what arcade machines the hotel we were staying at had. That trip the Reynolds clan took to Mammoth Caves? I can’t tell you anything about it other than that there was a Gorf machine and a Night Driver. Clifty Falls? Robotron 2084, Defender, and Rally X. Myrtle Beach? Killer arcade there on the board walk complete with Hercules pinball machine. But it was at the local Buy & Save where I found my favorite game of all time: Pac-Man. I remember playing nothing but Pac-Man for weeks on end, to the point that I achieved the ultimate glory: I got the high score in the arcade, which was posted on a corkboard. 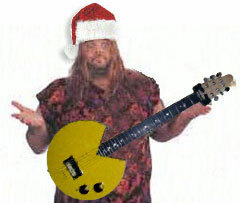 I’ve achieved a few accolades in my life, but RD Reynolds, Pac-Man King of Aurora, Indiana, may have been the greatest. So yeah, I spent my teen years focused on Pac-Man. I was talking about vacations above, and that reminds me of the fantabulous Knoxville World’s Fair. 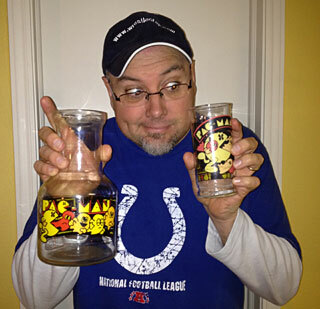 I remember nothing about that trip other than the fact that I got two of the most incredible pieces of glassware there, items I still have to this day. I still consider Pac-Man to be the best game ever made. 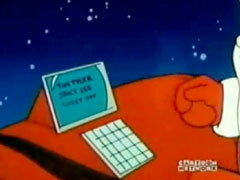 Which is ironic, as the Pac-Man cartoon series was one of the biggest piles of crap ever. So when I started doing these non-wrestling Christmas inductions ten years ago, I always thought, “I really need to do Christmas Comes to Pac-Land.” Why I wanted to torture myself in such a manner, I’m not sure. Maybe it was to exorcise a demon or something. 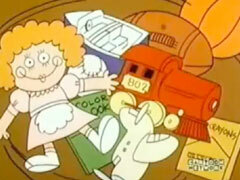 Whatever the case may be, today is my unlucky day, so let’s dig right into this mountain of garbage! 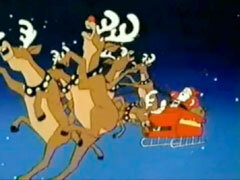 There are eight reindeer here. If 43 years of Christmas caroling has taught me one thing, it’s that there were nine reindeer: the eight originals plus Rudolph. 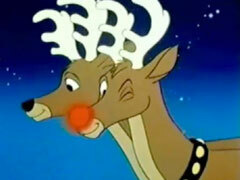 It could be the conspiracy theorist in me talking, but I can only assume that Rudolph, remembering all those horrific names and other such verbal abuse he suffered in his younger days, brutally murdered Donder following a Nam-style flashback. Rudolph, how do you sleep at night? If I had one of those when I was younger, I’d have played it so much kids would have mistaken me for Eddie Van Halen. As Santa bemoans his being so far behind schedule, he spends time talking about how awesome his new COMPUTER SYSTEM is and how that will help him get the job done on time. I’d ask how he was able to do it, oh, I don’t know, the 400 years before he was able to put a computer on his sleigh, but I’m more fascinated that a computer from 1982 somehow helps him. In fact, for Christmas in either 1982 or 1983, I got a computer. An Atari 1200XL. Don’t get me wrong, it played an awesome game of Popeye (and a pretty good game of Pac-Man too come to think of it), but GPS’ing the trajectories needed to get him all over the world in one night? Down below, we meet Pac-Man and his family: his wife Pepper, Pac-Baby, their dog Chomp Chomp, and their cat Sour Puss. Seriously, that’s the cat’s name. And they are outside this Christmas Eve making snow ghosts. Who makes ghosts of their enemies? And soon enough we see the ghosts. Let’s see if I can remember them by name. Blinky, Inky, Pinky, Clyde, and Sue? A quick Google search indicates I am correct, as if there were any doubt. And here Mama Deal always said I was just waiting my time playing this game. WHO WASTED THEIR YOUTH NOW?! Ok, stop me if you’ve heard this one before: the ghosts chase Pac-Man. 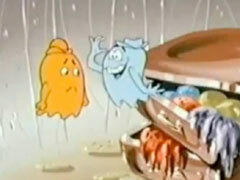 Sorry, the ghost monsters chase Pac-Man. 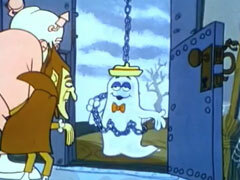 Not sure why these ghosts are alos MONSTERS, but the cartoon is VERY adamant that they are. Believe me, anytime the word “ghost” is mentioned, there is no breath before “monsters” is uttered. So yeah, they’re chasing Pac-Man, but unlike in the arcade game, here Pac-Man escapes them in a toboggan which he promptly drives off a cliff. I bet if he had a COMPUTER like Santa, he wouldn’t have nearly killed his entire family. 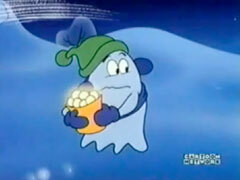 …and the blue ghost gets it right in the eyes. I note this only because he looks exactly like Boo Berry. I could go further, explaining how this blatant copyright violation led to Namco having to grant General Mills the rights to create Pac-Man Cereal at no charge in the early 80’s, but that would take a long time and I really need to finish this up before Christmas, you know? But hey, while I’m wasting time here, I should note that I almost did a different videogame Christmas cartoon induction. Yes, there were MORE THAN ONE. 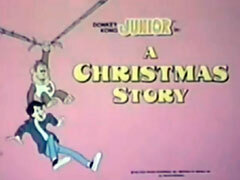 The other one I know of is Donkey Kong Jr’s “A Christmas Story.” Before you start sending hate mail or messaging me on Facebook or tweeting or Facebooking angry tweet mail or whatever it is you kids do these days, let it be known that this cartoon is actually very boring. I mean, it has that name right there and Jr. isn’t asking Papa for a Red Ryder BB Gun. 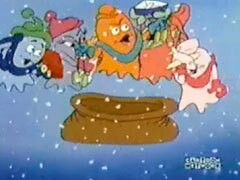 Still, I almost did that one because the villains in it are, no joke, HOBOS. I couldn’t bring myself to do it, though, because neither of them actually looks like Blade, and thus I had no real emotional attachment to it. Oh, and basically nothing happens the entire 10 minutes or so the show lasts. 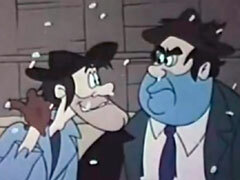 So yeah, if there was a category for “Best Animated Show Featuring a Videogame Character and Centered around Christmas” in the 1982 Emmy Awards, the winner would be Christmas Comes to Pac-Land. Speaking of which, I better get back to it. Oh yeah, the snowball fight. 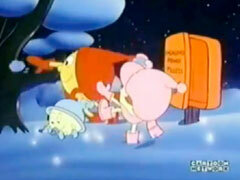 So there’s this snowball fight and Inky is an idiot and throws power pellets to the Pac family. They eat them, and just like in the game, the ghost monsters turn…pink? I’d rant and rave about that, but honestly I’ve seen home console ports of Pac-Man do things almost as stupid, so whatever. It comes to Pac-Land via a brutal crash killing Santa and all the reindeer. All the reindeer Rudolph didn’t already kill. The big question I am sure you all have: does Santa exist in the Pac-Man universe? The answer, surprisingly, is no. 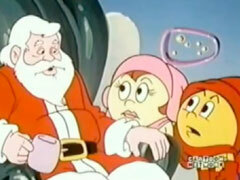 In fact, Pac and the Missus think that Santa is an alien. To be fair, he does live in outer space according to that Mexican Santa Claus movie. And he’s been to Mars. AND the cop in Pac-Land refers to him as a MARTIAN. Never thought of Santa as some weirdo from outer space, but all these horrible shows I’ve reviewed over the years are certainly making a strong case for it. 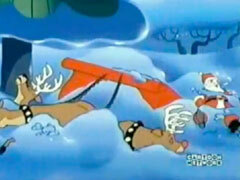 Anyway, Santa tries to get lift off, but his reindeer are stuck in the snow. And he’s got the sniffles. So the Pacs take him in and remove his pants. I hope Warrior’s not around. Anybody know what the proximity of Pac-Land is to parts unknown? 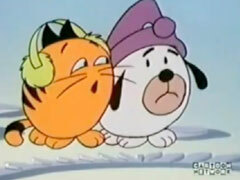 …which makes the animals VERY uneasy. That look can mean only one thing: in Pac-Land, goodwill means fricasseeing the pets. 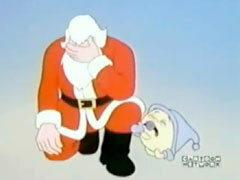 Santa realizes that he lost his presents in the crash, and it’s up to Pac-Man to go find them and get Santa on his way. 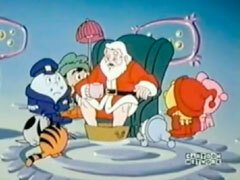 I’d ask why Santa couldn’t at least help, but you will soon learn that this is the least effective Santa ever. It’s like nothing has ever gone wrong for the guy, and he has ZERO clue how to fix even the smallest of problems. Oh and he complains constantly. I never thought I would hate Santa, but if I saw this as a kid of Santa-believing age, I would probably torch every Christmas tree I ever saw. Meanwhile, the ghost monsters…no, screw that. It’s stupid to say ghost MONSTERS, and I’m not doing it anymore. Screw you, Pac-Land. So the GHOSTS get back into uniform, and…seriously, look at that hat. If Inky shows up with a red bow tie on this show, General Mills is going to own everything Namco’s ever made, from Gee Bee to Tekken vs. Soul Calibur 12 or whatever their latest goofball fighting game is. With that as his cargo, I am suspecting there are going to be a LOT of unhappy children this particular Christmas. Eventually, the Pac-pooch steals the presents back while the ghosts chomp Pac-Man. Apparently get chomped makes Paccy look like he’s completely drunk. In fact, for the coming year, my resolution is going to be to use the word “chomped” in place of “drunk”. I urge you all to do it as well. 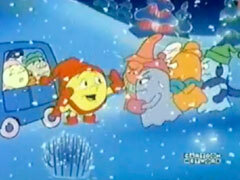 Anyway, after about 10 minutes of walking through the snow, Pac-Man gets the presents back to Santa who is thrilled. No wait, instead, Santa breaks down and starts WEEPING because Pac-Man is too late and he won’t be able to get gifts to everyone tonight. Again, LEAST EFFECTIVE SANTA EVER. To which I say the following. Quit crying and get to delivering! Sure, you may not get to everyone, but you can at least cover the US, Canada, and a good chunk of Europe I bet. Who cares if you don’t get to North Korea? Pac-Man basically gives the same pep talk, just without blasting poor North Korea in the process, likely due to the fact that he was born in the region. You see, unlike Santa, he’s got an idea! Into the Pacmobile they go, with Santa (probably still boo hooing) following behind. But alas! 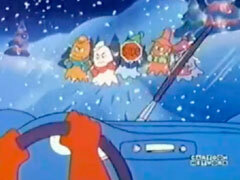 Their path to getting Santa on his way is blocked by the evil ghost monsters! 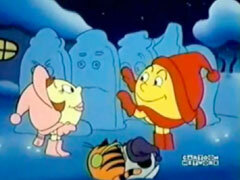 And yeah, you do know how this plays out, as Pac-Man convinces the bad guys to help them out and save Christmas. 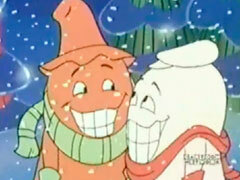 And so the ghost monsters cry, then have a change of heart, which causes them to smile. Just one word for that. 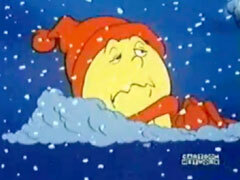 Oh, and Pac-Man’s magic remedy for saving Christmas? 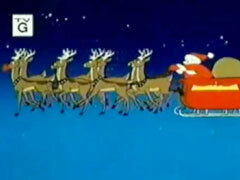 Get the reindeer all hepped up on power pellets. See kids, sometimes drugs ARE the answer. And so everyone gets presents, ghost monsters included. The standard pan up, pan down shot of Santa flying past the moon (with contractually obliged idiotic catchphrase) and Christmas has left Pac-Land, hopefully never to return. 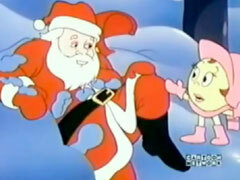 Never thought I’d find a cartoon that made me hate both Pac-Man and Santa, but there you have it. But you know what? Even this thing can’t get me out of the Christmas spirit! I hope all of you have a GREAT Christmas/Hannukah/Kwanzaa/Whatever, and may God bless us all in the New Year! INDUCTION: Eric Young's Christmas Party - Why Would Santa EVER Go To TNA? 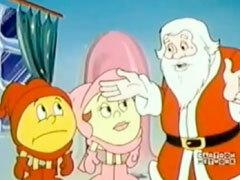 11 Responses to "CLASSIC INDUCTION: Christmas Comes to Pac-Land: The Cartoon That Will Make You Hate Pac-Man AND Santa"
I have not watched the whole thing, and I’m glad I haven’t. As someone who used to review games, I will say that you have impeccable taste. Pac-Man is indeed one of the top games of all time, rivaled only by Tetris and 8-bit Mario. I can’t hate Pac-Man for this. Just like I can’t hate Mega Man, Simon Belmont or Pit for how they were interpreted in Captain N.
Also has anyone ever noticed how creepy that art for Pac-Man on those mugs is? Seriously Pac-Man has the dead eyes of a monster in that. That Pac-Man guitar needs pellets on the neck, with a super pellet in place of the headstock. That’d be Tekken 7, which include an otaku girl. What? I like the series. For the record. 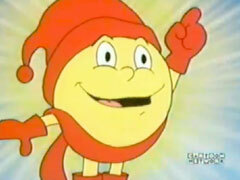 when the original Pac-Man arcade game came out, Blinky & Co. were referred to as monsters. When the Atari 2600 game came out, they were referred to as ghosts because the game couldn’t render them without having them blink. “Ghost Monsters” was a way to combine the names. You think you’re the biggest Pac-Man nerd, RD? NOT EVEN CLOSE, BUD! When you went to the Worlds Fair in Knoxville, were you able to go visit the Wigsphere? PacManCarafe.com! I bet that URL’s not taken! Where’s Ms. Pac-Man? Come to think of it, why didn’t they call her Pac-Woman? 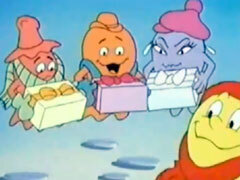 The way I interpret Ms, Pac-Man is that she is either Pac-Man’s mother or a Transexual Pac-Man. Not like there is anything wrong with that. there is no Pepper and Ms. Pac-Man is naturally Pac-Man’s wife. So regardless of how terrible this film is, it’s greatest crime is creating a character that didn’t exist in the Pac-Man universe, unless Ms. Pac-Man’s actual name was Pepper. I guess that would make her Pepper Pac-Man. So is Pac-Man like Mario and his full name is Pac-Man Pac-Man? Also what in the blue hell is a blue hell and why hasn’t any Wrestler past or present been billed as being from blue hell?